A Merry Tiller of many parts, including an engine built from three – inc a change of crank and piston. Wheels off a Landmaster mower, throttle from a Wheel Horse. 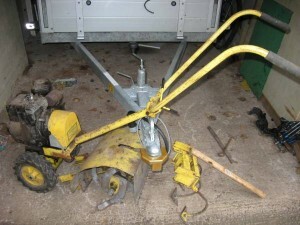 Horticultural equipment collectors are, in my opinion, quite good at recycling in order to keep their hobby rolling along. One only has to look at a collector’s spares heap or the garage workbench with the aroma of WD40, a line of jam jars full of ‘important bits’ and some paper towels surreptitiously purloined from the kitchen to see how much repairing, sharing and salvaging of machinery parts goes on. As an example; these past few weeks I’ve brought a Merry Tiller back to life (image on right), it wasn’t so much as a kiss of life it needed but more of a whole heart and limbs transplant. It’s had so many parts from a large array of expired machines that I’m sure Frankenstein couldn’t have done a better job, but the Merry Tiller runs, it lives to fight another day even if it no longer resembles the picture on the 1970’s brochure unless one squints a bit, thankfully the Merry Tiller admirably battles on to do the job as it was originally intended to do. But instead of all the old machinery that we collect, restore and patch-up there is a huge amount of new and temptingly cheap machinery on the market. I could of splashed out 169.99 of my sacred Yorkshire pounds and bought a new knock-off Merry Tiller, but I wouldn’t have had as much fun, besides guilt would have set in too. Yet I’m sure we’ve all noticed cheap-as-chips mowers, tillers and hand tools in DIY stores and catalogues tempting the average homeowner into buying a new piece of equipment, but how much of this ‘stuff’ actually is there? Recently I came across a mind boggling figure in a trade article that said 3 million watering cans, plastic or otherwise, had been successfully flogged to the general public in 2018. How many will last even a handful of years? Or on a wider scale how many of the presumably tens of thousands of mass produced built-to-a-price domestic garden implements, tools or plastic-bodied machines built with a short lifespan in mind will ever merit or even reach preservation? On the search for a Black & Decker battery powered hedge trimmer, will one ever surface? It’s a thought that we are able to still find and collect some brilliant old machinery and as importantly generally be able to source parts to keep them in working order. I wonder how many old machines from the 20th century and worthy of preservation in the 21st century may get discarded by homeowners at the landfill or go for scrap to sadly be replaced by a newer yet potentially less quality machine. 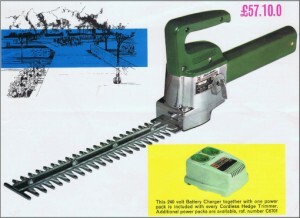 But disposing of expired equipment is nothing new; I’m still on my search for an original 1960’s Black & Decker rechargeable hedge trimmer, an item which after the internal batteries no longer performed as intended would unfortunately fit neatly in a galvanised dustbin of the time, the search continues. Yet this mass production of machinery and equipment is not a new phenomenon. Manufacturers always had the ambition to balance production with as much profitability as possible, whether it’s machinery or watering cans or as in 1973 when Ginge-Raadvad were considering 80 miles of reinforced PVC garden hosepipe. A figure which seems quite incredible but they would have decided that it was an amount that could be sold easily to the UK public and so 80 miles it is. But tools, hosepipes, watering cans and machines do reach the end of their lives and as such there are definitely some scare tools and machines about, perhaps once produced in their hundreds or even thousands there are some which are now almost lone survivors. These items and machines are now reappearing, partly due to social media and the internet, they are creeping out of the woodwork or more aptly surfacing from under tarpaulins in overgrown gardens. 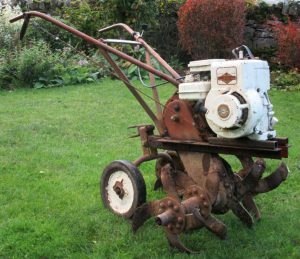 Some machines find their next performance not in a garden but on an auction site described as ‘barn find’ and ‘rare’ even if they’re not and which doesn’t necessarily equate with the heart-stopping price that is being asked anyway. As mentioned, machines are turning up, so here are two machines as examples in the UK. Several years back I looked up Yellowbird tillers, couldn’t find one here although in other overseas countries one can almost fall over one in every garden shed, but they are reappearing in UK gardens on a regular basis, where have they all been hiding? Are the Yellowbird tillers gathering to plan a mass migration? And the 1964 Remington tiller from Watveare Ltd in Devon, I have the advert but several years of looking and not a sign of a single machine until that is two, separately, turn up for sale on the internet not far away, they were here all the time just squirreled away. It would appear that whatever you are looking for, whether it was mass produced or created in a small quantity, then it may be closer than you think, of course part of the fun is seeking out that machine, the research and bringing it back to life. And harking back to the good old days of my childhood I’ve decided then that searching for and collecting all the vintage horticultural equipment and spending hours at the workshop bench to bring it back into use is like being a cross between a Womble who were always “Making good use of the things that we find” and those mice on Bagpuss cheerily chanting “We will fix it” to anything that’s broken. Which reminds me, I’ve got an Iseki rotavator but it’s sadly ill and needs resuscitating, I’m thinking of sending it to those mice, that’ll stump ‘em! *Footnote. Younger readers may need to visit Youtube to see the delights of both the Wombles and Bagpuss.